Tollymore National Outdoor Centre offers a rolling pool facility which is second to none. The indoor heated rolling pool has been built specifically to allow the latest in coaching methods to be utilised when rolling is being taught. 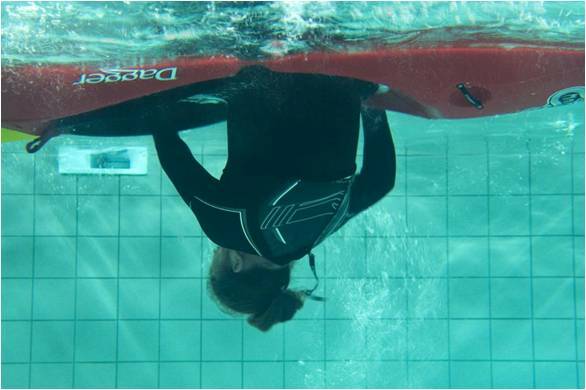 The pool will comfortably accommodate three kayaks, enabling groups of up to six people to be coached simultaneously. It has two underwater viewing windows as well as a viewing area. If you wish to use digital video or photography, there is access to a large flat screen monitor immediately outside the pool area. The pool also has dedicated wheelchair access. A full range of equipment is available, including kayaks, paddles, spraydecks and buoyancy aids. The pool is located beside the training room, with its weights and kayak machines, providing a perfect coaching environment. Tollymore runs a range of kayak pool courses and the rolling pool is also available for hire by clubs and other organisations. For further information regarding this please do not hesitate to contact the Centre. As well as the courses detailed below Tollymore will offer a series of stand alone courses either as two day intensive or evening classes.